Israeli President Shimon Peres has suggested that a Palestinian state could be established with provisional borders, in an effort to resolve the deepening rift over the direction of the Middle East process. The president made the comments yesterday during a meeting with Javier Solana, the High Representative for the European Common, Foreign and Security Policy. The Israeli government has come under increasing pressure from the Obama administration to sign up to the two-state solution and the Annapolis peace process, an initiative which the new Israeli government has been reluctant to espouse. Recognizing the failure of the Gaza disengagement in 2005, Netanyahu has instead attempted to focus on improving the lives of the Arabs in the territories, hoping that their increased prosperity will encourage the prospects of peace. Israel's reluctance to commit to the establishment of a Palestinian state may be justified given the Palestinian refusal to put an end to terrorism, but it has become a tool in the hands of a US administration that is seeking to repair its damaged reputation with the Arab world. No longer are Palestinian bombs and bullets perceived to be the main obstacle to peace in the Middle East, rather Israeli buildings and roadblocks are now seen to be the root cause of the impasse. Thus the Israeli government is coming under increasing pressure to toe the new American line. Netanyahu plans to give an address on the peace process on Sunday in response to EU and US pressure to commit to the unthinkable. And in an effort to ease political pressure on Israel and influence Netanyahu's speech, Israeli President Shimon Peres has suggested that the government implement stage 2 of the Roadmap to Peace plan, the establishment of a Palestinian state with provisional borders. Quote: ""Basically, we can use the second stage of the Road Map – a Palestinian state with temporary borders, under the promise that this would not be the end of the negotiations and the temporary borders would be placed with permanent ones," the president said. Solana clarified that the EU saw eye-to-eye with the United States in regards to the firm stance presented by President Barack Obama over the diplomatic demands from Israel. He said that the Europeans and the Americans discussed the issue on a daily basis, and expressed his hope that the Israeli government would contribute to the creation of a new reality in the region. Of course a state with provisional borders was previously offered to the Palestinian Authority by the more liberal Olmert government. The deal was soundly rejected by President Abbas, who demands nothing less than a full Israeli withdrawal to pre-1967 borders, because he knows that is the extent to which the international community will back him. The issue is not about the rights of the Palestinian people to self-governance at all. It's about the destruction of the Jewish state. That is why Abbas refuses to recognize Israel as a Jewish state. That is why he insists on getting the maximum amount of territory from Israel in the peace process. And that is why if he can't get it, he is willing to forsake the 'Palestinian dream' and opt instead for a bi-national state, which would result in the demographic destruction of the Jewish state. Quote: ""We are committed to the solution of two sovereign states but we will still have the choice of a dual nationality state" if Israel rejected U.S. calls to endorse a Palestinian statehood alongside its lands, said Riyadh al-Maliki, Palestinian foreign affairs minister, in a statement sent to media. "In a matter of 20 years, we can be the majority in the dual nationality state," al-Maliki added, accusing Israel of responding unclearly to international calls for recognizing a Palestinian statehood in the Gaza Strip, West Bank and East Jerusalem. The Bible indicates that there will be an attempt to establish a Palestinian state. In the middle of a period of time known as Daniel's 70th week, the Bible states that the land of Israel will be divided (Daniel 11:39), and Israel's enemies will be in siege against Judea and Jerusalem (Zechariah 12:2, 14:2). Rather than bringing peace and security, the division of God's land will become a precursor to Har Megiddon (Armageddon - Revelation 16:16), in which all the nations of the world will be brought together to the valley of Megiddo in preparation for battle against Jerusalem (Joel 3:2). Rather than the Middle East peace process helping to resolve other regional conflicts, the division of God's land will become the focal point for World War III. But there is good news. 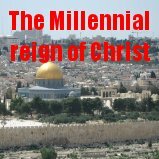 The fact that the EU and US are now pressing for the establishment of a Palestinian state in territories mentioned in Bible prophecies over 2500 years ago proves just how close we are to the return of Christ. For when the armies of the world surround Jerusalem and when God's chosen people have nowhere else to turn, the Lord Jesus Christ will return to this earth and save them from destruction. And then He will establish His Kingdom, of which it is said there will be no end. What a wonderful day that will be. But will you be a citizen of this kingdom? The Lord Jesus said that unless you are born again of God's Spirit, you cannot enter into His kingdom (John 3:3, 5). We are born of God whenever we recognize the fact that we are sinners, and we repent of our sins and come to Jesus Christ for forgiveness. He is the only one who can forgive our sins, because He is the only one who was sinless and was able to pay the price God demands for our sin. None of us deserve forgiveness, but God offers it to whoever will believe on His Son for salvation (1st John 5:11). Why don't you turn away from your sins, and trust in the Lord Jesus Christ for salvation today.